Venus will shine brightly in the eastern sky just before sunrise this fall. All through the spring and early summer, the planet Venus dominated the western evening sky. Now, as summer turns into fall, Venus will dominate the eastern sky before sunrise. Venus has erupted into view in the eastern morning sky for the past couple of weeks. As September opens, this resplendent "morning star" will be rising just as dawn's first glow begins to light up the sky, just before 5 a.m. local daylight time. By month's end, Venus will be rising around 3:30 a.m. local time, preceding the sun by some 3.5 hours. For early risers, seeing Venus emerge from beyond the horizon in complete darkness and then slowly ascend the eastern sky is truly an eerie sight. Those who live in rural areas far from any extraneous light have reported that the light from Venus is bright enough to create faint shadows. Try also looking for Venus through the brilliance of the daytime sky. It can be done if you know exactly where to look. On the morning of Sept. 10, Venus will be situated to the upper right of a lovely thin crescent moon. If you can still see the moon after the sun rises, look for the speck of light that is Venus to the moon's upper right. Venus was at inferior conjunction on Aug. 15, in line between the Earth and the sun. But through September it is swinging away from that line, speeding ahead of the Earth in its faster orbit. So looking at the planet through a telescope, it will appear as a large, brilliant, beautiful crescent that waxes in phase all month, while also shrinking in size. As September opens, Venus will be only 8 percent illuminated, but by month's end, that figure will have increased to 34 percent; but because it will have receded 16.36 million miles (26.32 million km) from Earth, it will appear more than one-third smaller than it did at the start of the month. Although Venus is receding from Earth, it is going to have a long run as a prominent morning object. All through October it will rise within a few minutes of 3:30 a.m. local time. On Oct. 26, it will attain its greatest western elongation from the sun (46 degrees). During November and December it will begin to descend back toward the sun's vicinity. On Christmas morning, Venus will appear as a dazzling bright spot in the east, rising around 4:15 a.m., more than a full hour before dawn breaks. Continuing to get progressively lower in the southeast sky and closer to the sun as 2016 opens, Venus finally rises after the break of dawn by mid-February, around 5:30 a.m. By that time, its gibbous disk will appear quite small as it dips deeper into the brightening morning twilight. For most people, the last views of Venus will probably come right around the time of the equinox (March 20th). By then it will be rising only about 45 minutes before sunrise. Assiduous observers might be able to detect it, very low to the horizon, almost smothered by the bright twilight. When will skywatchers again be able to sight Venus? Not until sometime in July or August 2016, when the planet again returns to the western evening sky. 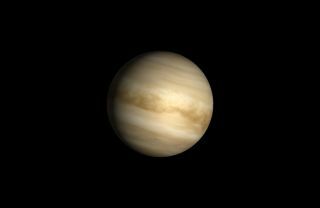 Editor's note: If you capture an amazing telescope view of Venus or any other night sky view and want to share it with Space.com, send images and comments in to managing editor Tariq Malik at: spacephotos@space.com.